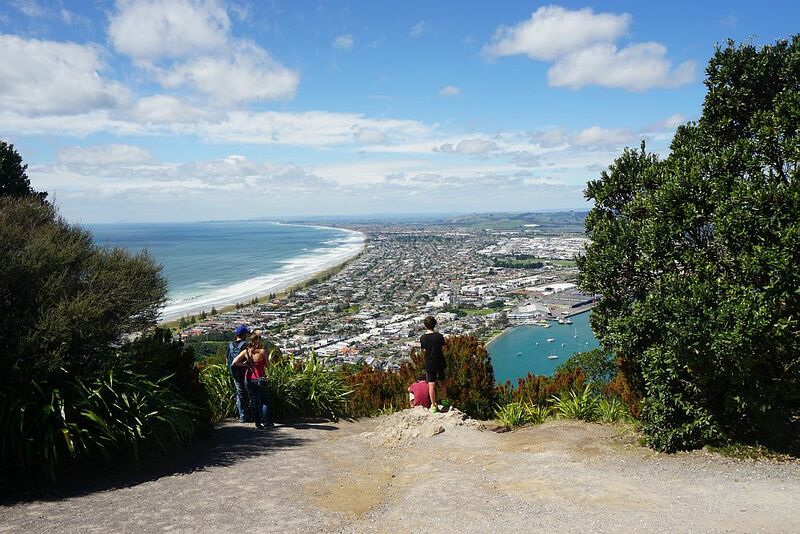 Mt Maunganui/Mauao, or simply “The Mount”, is a 231m high volcanic cone at the end of a narrow peninsula, with Tauranga Harbour on one side and the Pacific Ocean on the other. 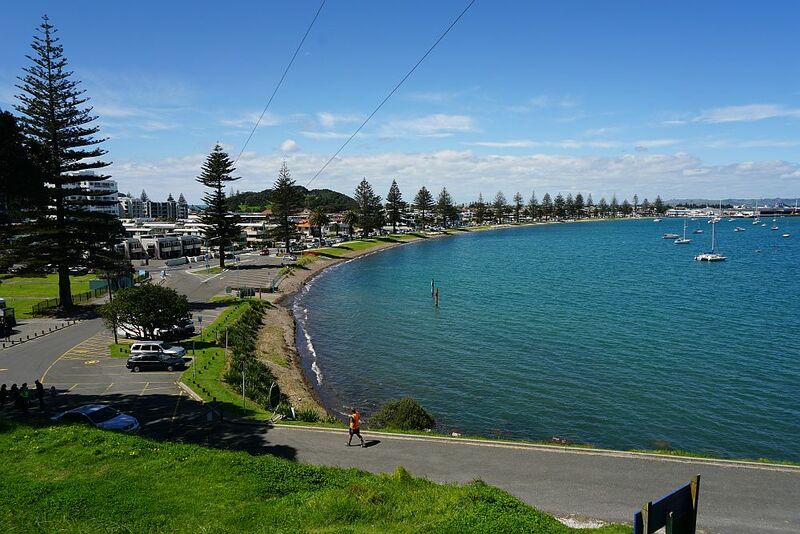 Mt Maunganui town, on the peninsula, is a suburb of Tauranga. The mountain is a popular recreational area. 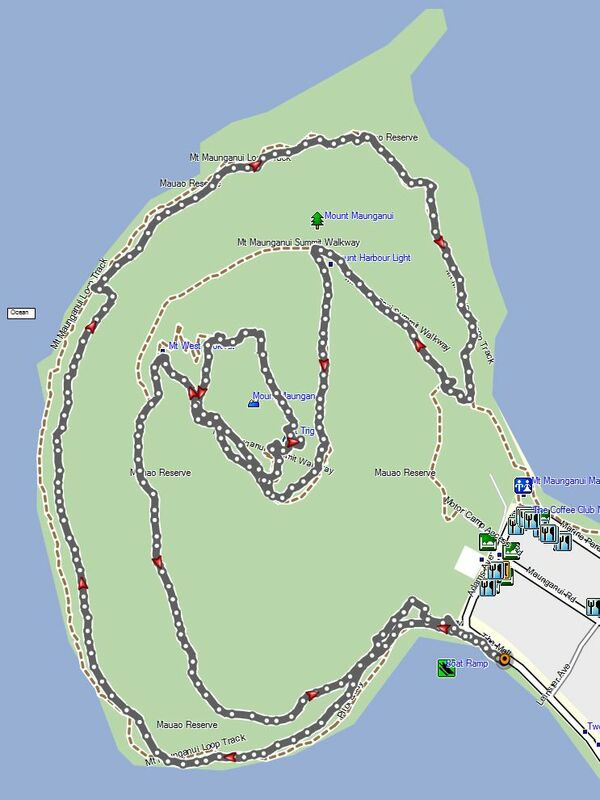 The track around the base is well formed and an easy walk with no steep areas. There are two main tracks leading to the summit. One is a 4WD track, and a relatively easy walk, but with slippery small stone chip on the steeper parts. The other is a steeper track with a number of steps. 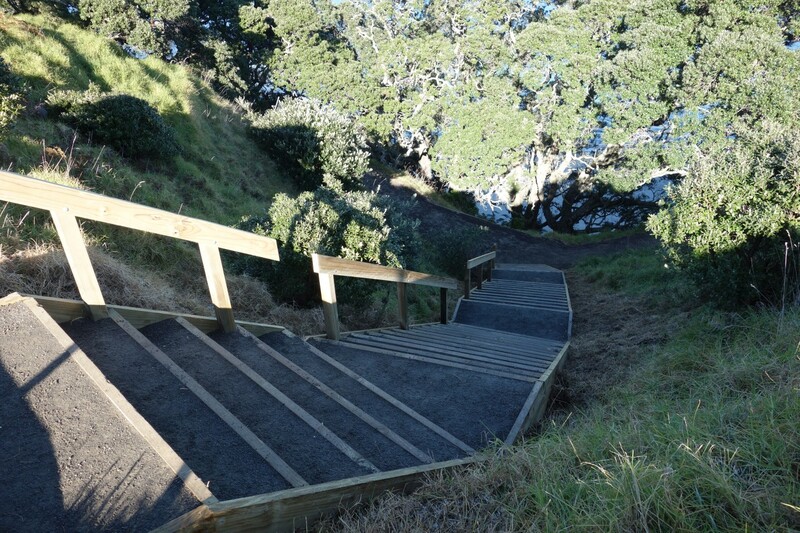 Some of the previously accessible steeper tracks are no longer open, due to slips. 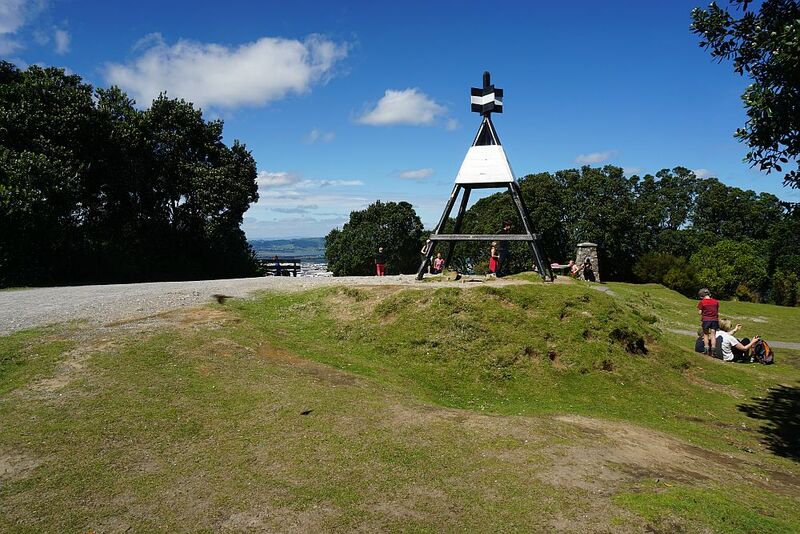 The walk around the base track can be done in less than an hour, and the climb to the summit and return to sea level can be done in about an hour, depending on fitness level. Total distance for both is about 6.5km, depending on the tracks taken. Ships entering and leaving Tauranga Harbour pass very close to the mount, through the narrow channel between the mount and Matakana Island. During the cruise liner season, from about October to late March, many visit the mount just to see the ships passing through the channel. There are several small beaches by the base track. On one of them an artist can sometimes be seen drawing pictures in the sand. These have a 3D effect when viewed from the hillside. Since the beach is covered by water at high tide the artworks only have a limited lifetime. 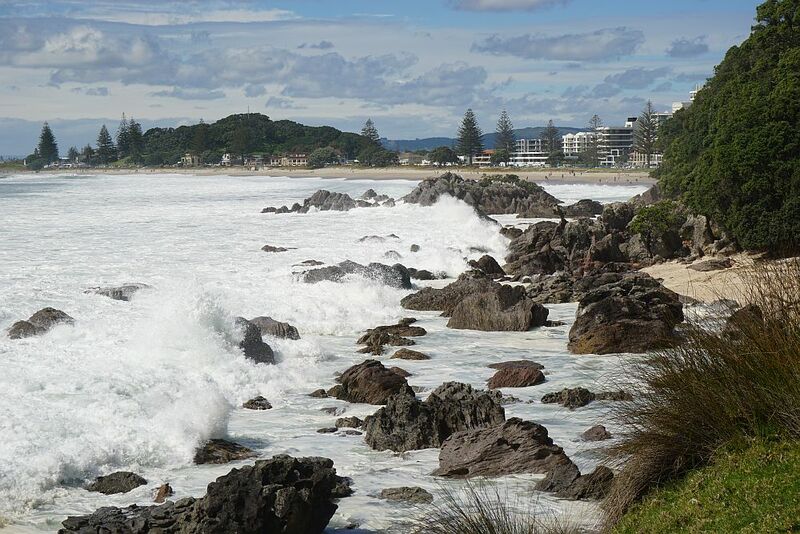 After a few days with strong southerly winds, the surf is impressive, with huge swells on the ocean. Combined with high tide it can be an impressive sight. Unfortunately it can also be dangerous. 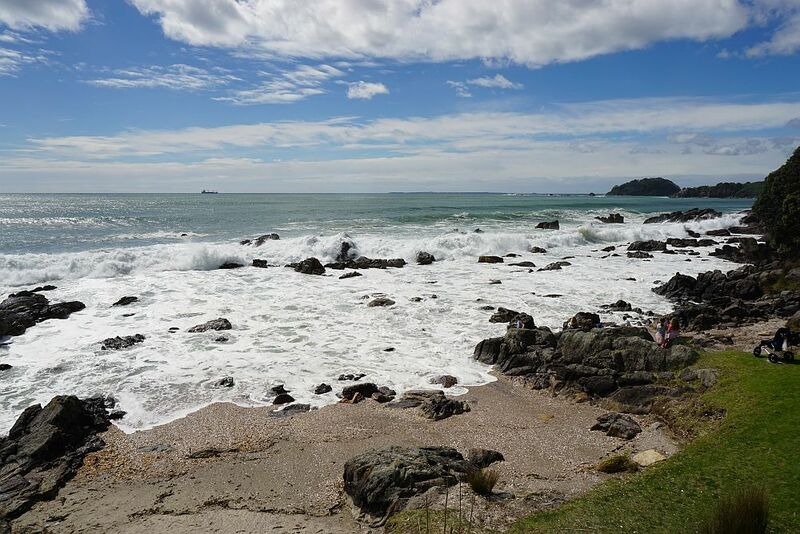 Today several surfers were rescued, and tragically a 5-year old boy was caught by a huge wave and swept out to sea while playing on one of the beaches. 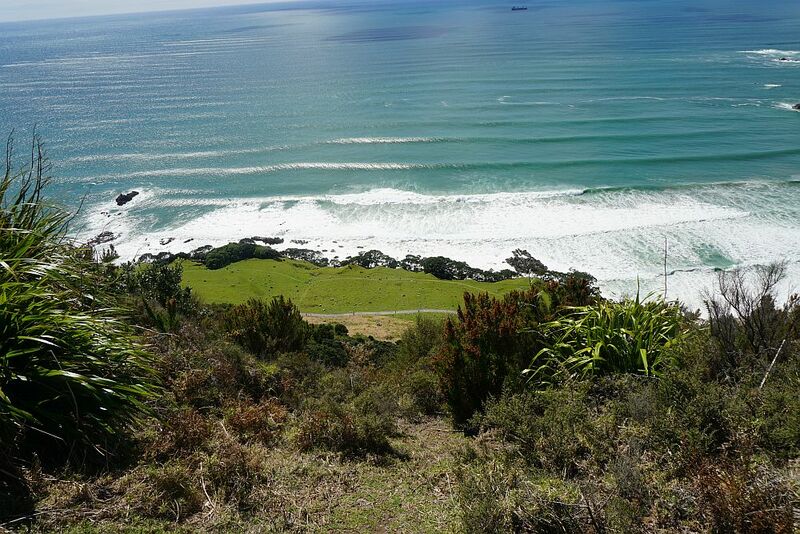 On the steeper eastern summit track there are good views along the ocean beach. 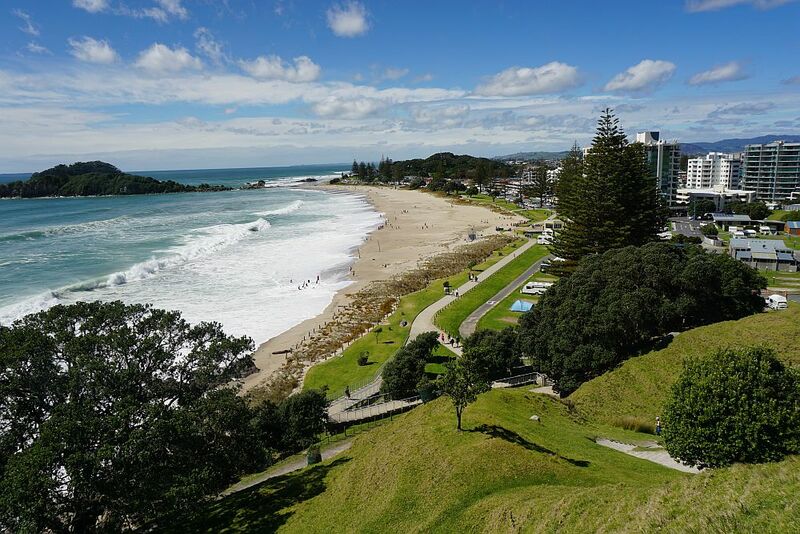 From the summit there is a good view over Mt Maunganui township. 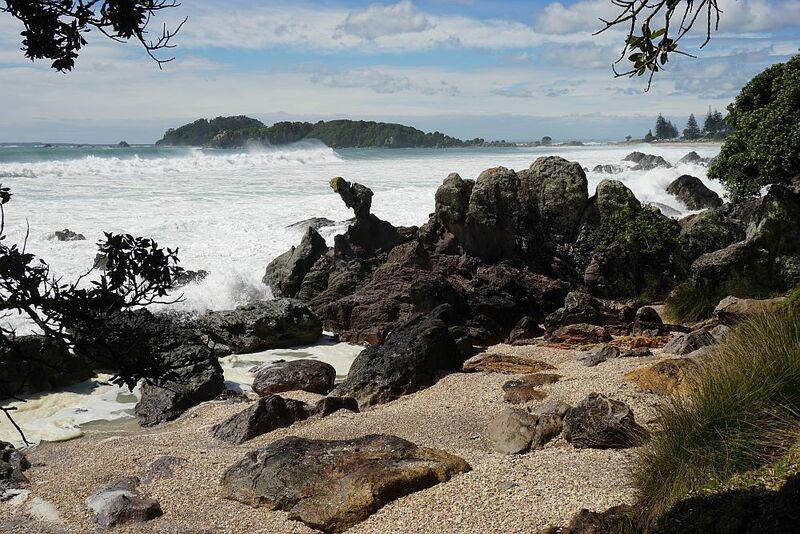 The summit of Mt Maunganui/Mauao. 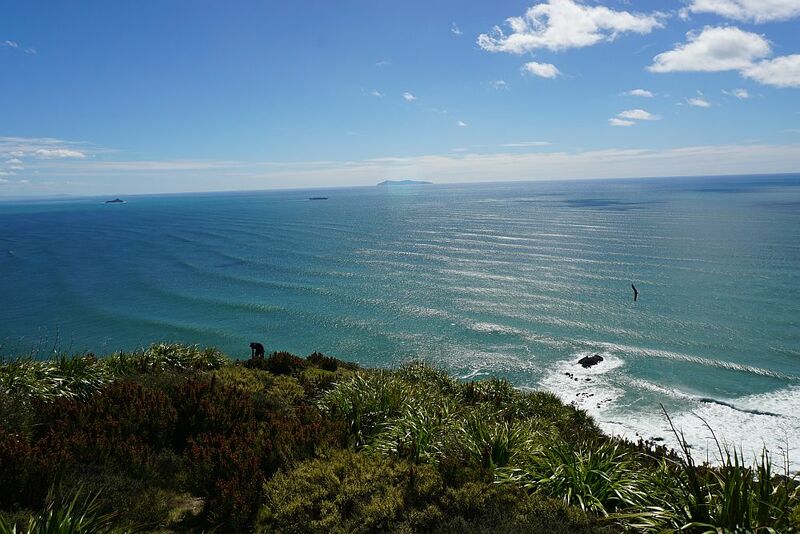 The heavy swells and waves can be seen clearly from the summit. Also a part of the base track can be seen near the centre of the first picture. The lower part of the mount is grazed by sheep. So there are gates to pass through on the tracks. 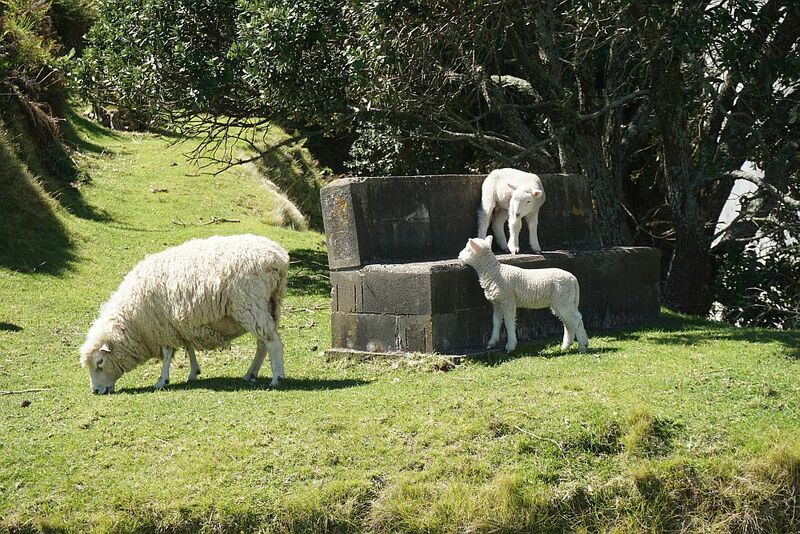 Here twin lambs are playing around while the mother is grazing. Pilot Bay, with a row of distinctive Norfolk Pine trees, seen from the lower end of the 4WD summit track. The following photos were taken on previous walks, during cruise liner season. 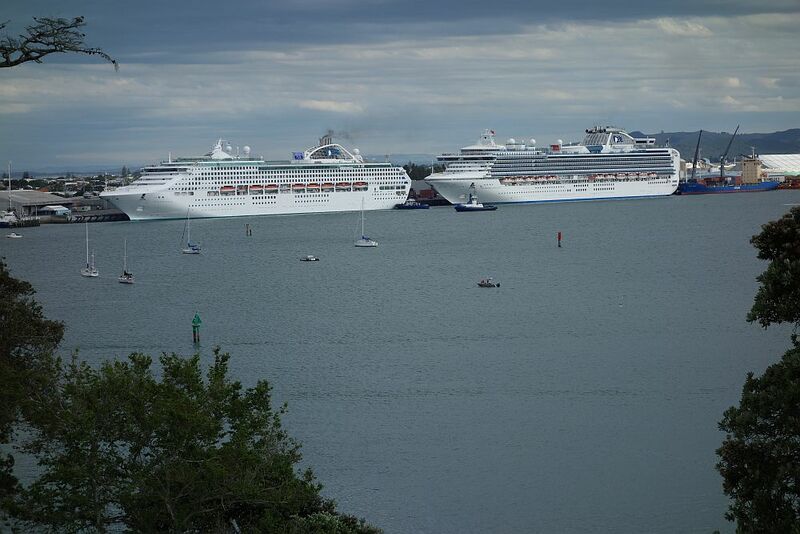 One of the largest cruise liners which has visited the port of Tauranga. 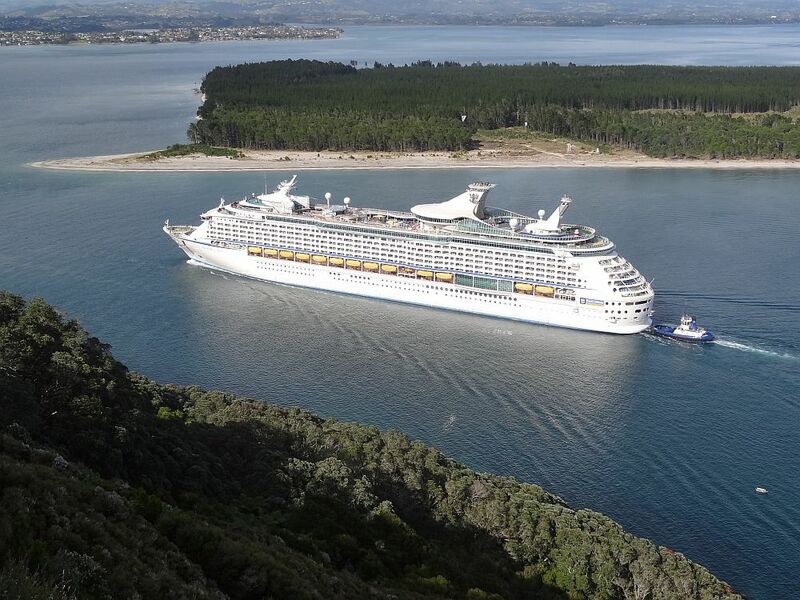 The eastern end of Matakana Island is immediately behind the cruise liner. There’s not too much room at the passenger vessel berths for two large cruise liners, although a smaller third one can be fitted in as well, as occasionally happens. 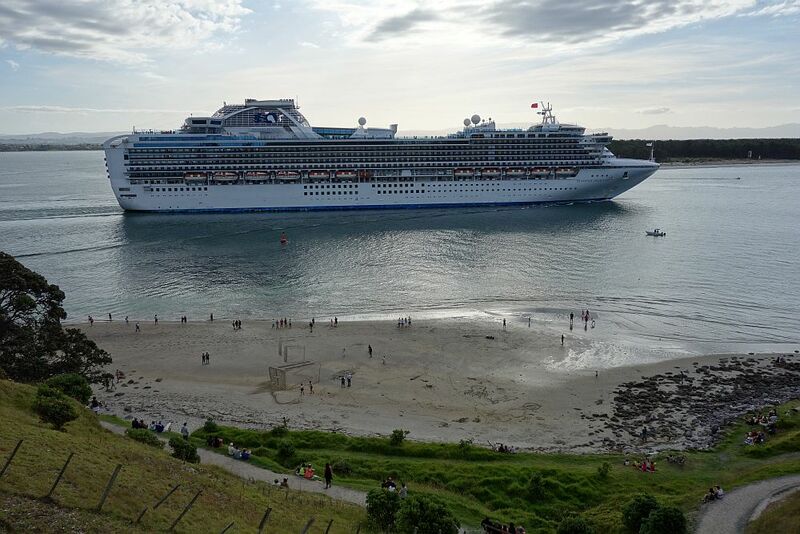 One of the cruise liners leaving port, and passing through the channel between the mount and Matakana Island. 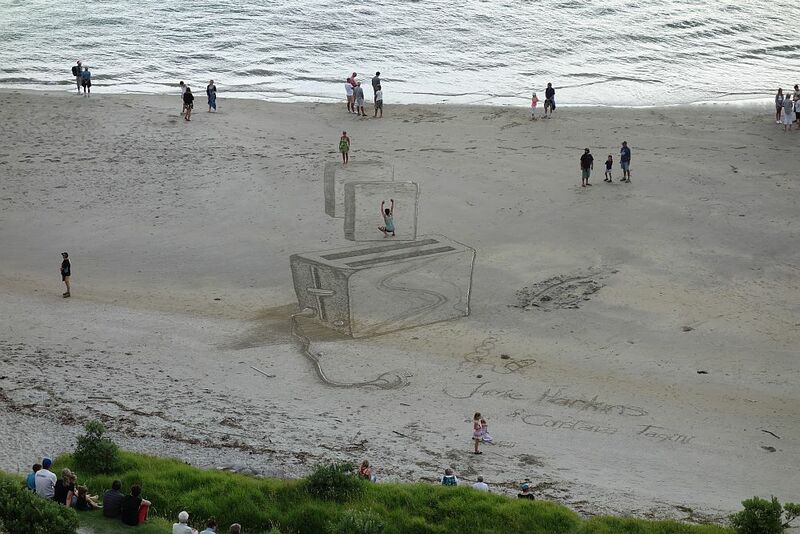 The sand art can be seen on the beach in front of the liner. A closer view of the sand art, made with simple tools like a rake. Other images by the artist, Jamie Harkins, can be found by searching for his name on the web. 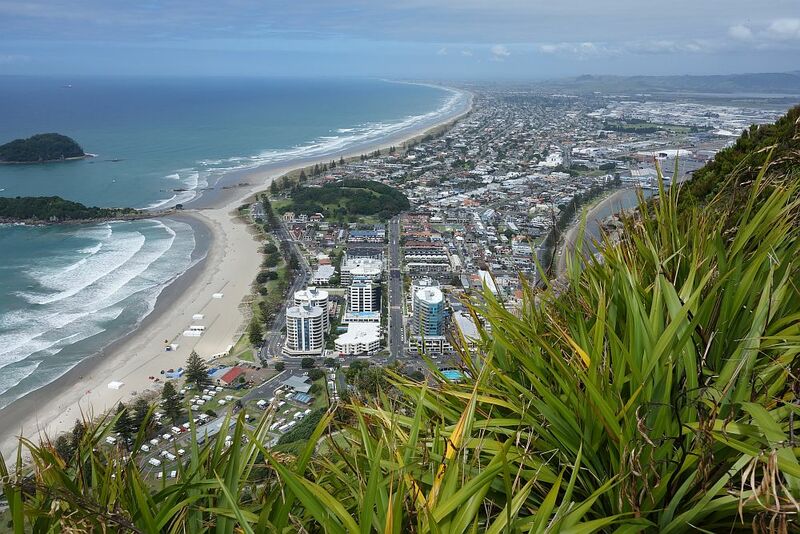 A view of Mt Maunganui township, taken in February 2014 from near the summit on the steeper track. 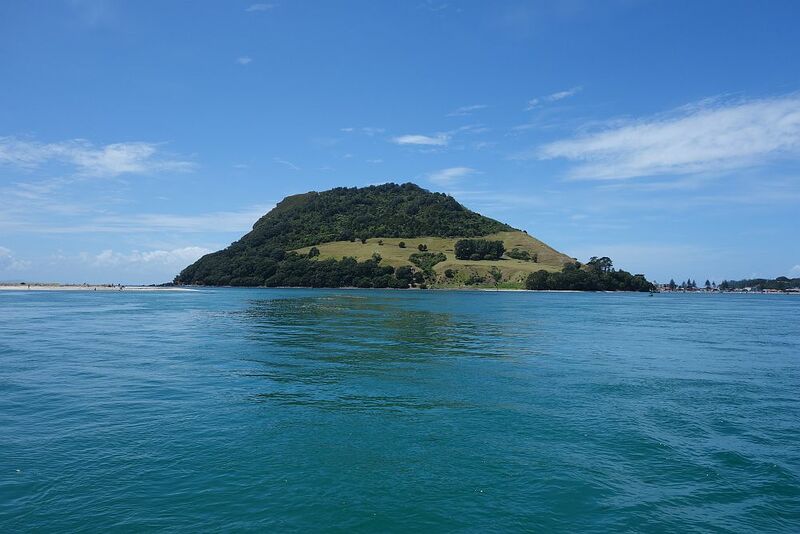 Mt Maunganui/Mauao seen from the Tauranga harbour, during a harbour cruise. The township is to the right, and the eastern end of Matakana Island to the left. The tracks were walked on October 1, 2014, and on several previous occasions. The GPS track log is from October 1. Total distance about 7km, total time just under 2 hours, including time to take photos. 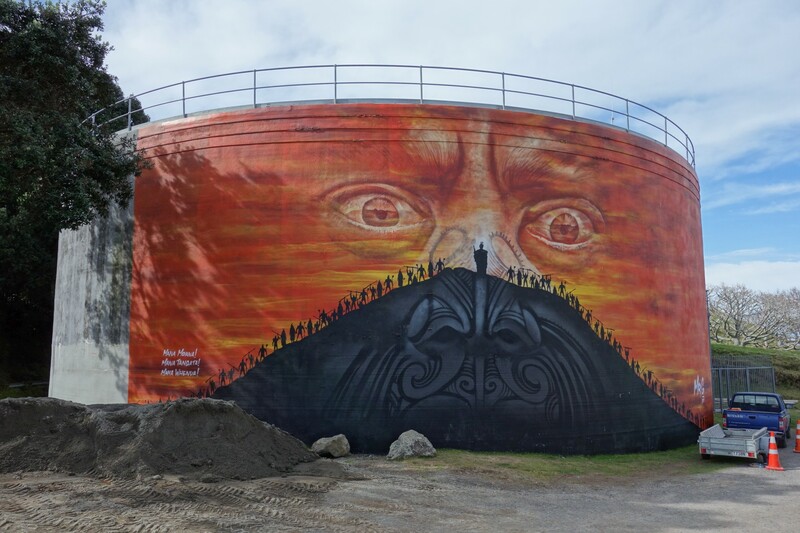 A painting by artist “Mr G” has recently been completed on the large water reservoir alongside the 4WD track to the summit. The painting is facing the harbour entrance, so should be clearly visible from ships entering and leaving the harbour. 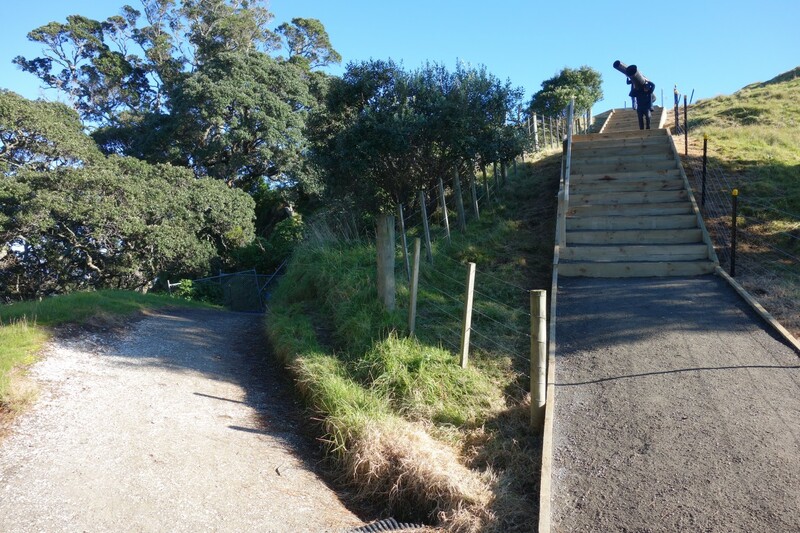 After being closed for over 3 months the base track was reopened at the end of July 2017, using a short track with steps to bypass a serious slip which occurred in early April 2017. The slip is at the south-western part of the base track. A permanent bypass below the current track is planned, but will take several months before it is completed. The steps and the temporary bypass will then be removed. The steps at the eastern end of the short bypass track. The steps at the western end of the short bypass track. 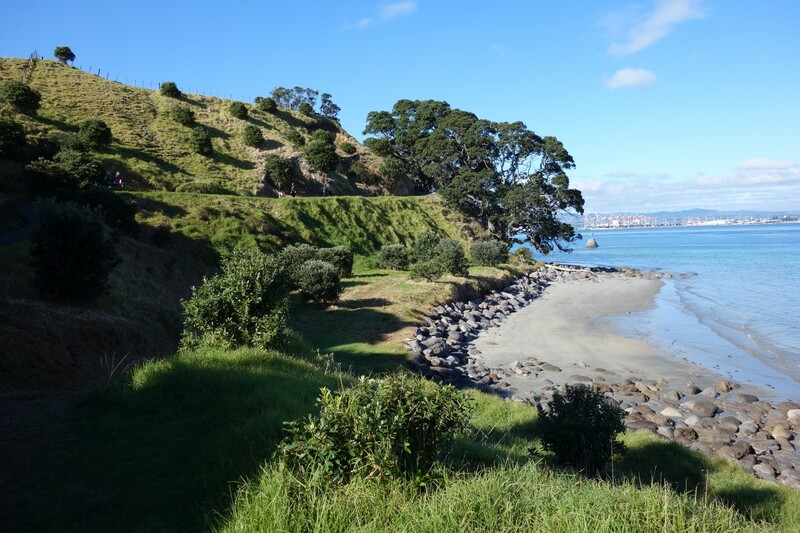 The western end of the bypass is located by the large pohutukawa trees at the far end of the beach. The statue of Tangaroa at the harbour entrance can be seen immediately to the right of the pohutukawa trees. 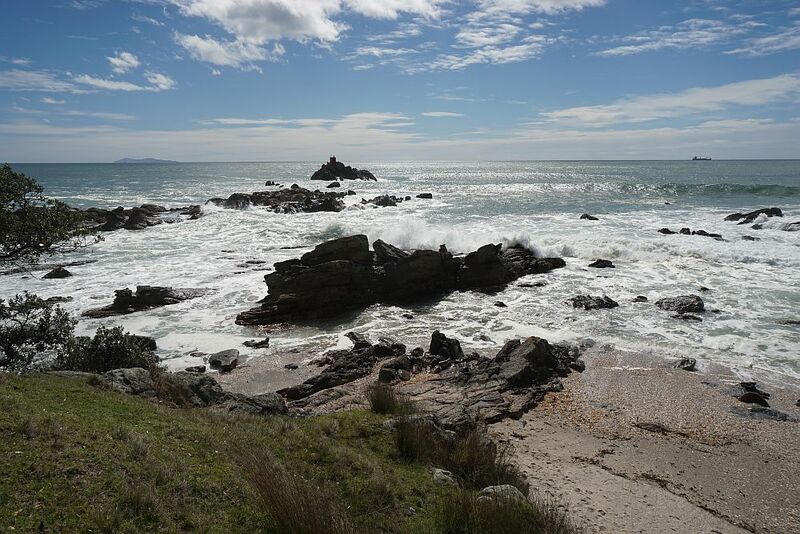 This entry was posted in Walks and tagged Mauao, Mt Maunganui, Tauranga on 2014-10-01 by nzartig.